Posted March 27, 2019 by Caroline Low & filed under Services. The question that many of the people talking to Cresset Discovery Services ask is “I have discovered some interesting biology – how do I turn it into a drug?”. If this is you, then read on. Let’s look at some of the ways that we can use in silico technology to translate your ideas into chemical tools in the first instance. Optimizing the drug-like properties of these early hit compounds will put you on the road to defining a lead series and onwards to nominating a drug candidate for clinical studies. The first step in the drug discovery journey is to find a chemical starting point, a molecule that binds to your target and either blocks or enhances its activity. Your overall aim may be to block a key point in a signalling pathway, or divert it to an alternative route. Alternatively, you may want to prevent levels of a particular cytokine from building up or block the activity of an enzyme, a receptor or an ion channel. Don’t overlook the fact that you may already have found chemical tools that modulate your biological target – what are its physiological activators, are there any literature compounds or known drugs we can use to get you started? What is known about the protein target? Do you have structures of your system, or are there examples of close relatives on the Protein Data Bank? Can we learn from off-target effects of other compounds or scaffold-hop from one chemical series to another to create new intellectual property. Using computational chemistry effectively can both considerably speed up hit finding and reduce the costs of running large physical screens. The best approach to take will depend on the type of bioassay that you intend to use. For example, you can test many more compounds in a plate-based enzyme assay than you can screen in a complex phenotypic system so you need to decide whether you want to test thousands of compounds or would prefer to look at a smaller bespoke set of compounds. In both cases, initial steps will focus on defining the bioactive conformation of one or more compounds that bind to your protein. We use these as pharmacophores to search for similar compounds that will have the same biological effect. By applying the XED force field we take a unique view of molecules which means that we can compare different chemical classes directly. This is a better reflection of how proteins ‘see’ other molecules and explains how drugs bind to sites that evolved to interact with peptides, DNA or other natural products. In summary, we are looking at the wider electrostatic and shape properties of molecules that extend beyond their atomic skeletons and are responsible for their biological properties. One popular option for kick starting the search for a hit compound is to use Cresset Discovery Services to run virtual screens. 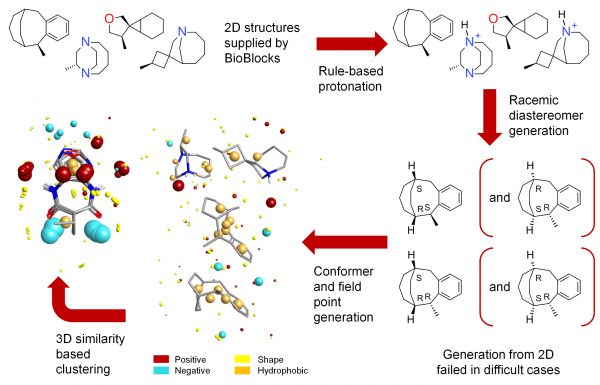 By using Blaze (an effective ligand-based virtual screening platform optimized to return diverse new structures) or Flare (which provides fresh insights into structure-based design) we can search a library of 20 million commercially available compounds. The output will be a list of compounds ranked by the similarity of their field point patterns to your pharmacophore. We can filter the list to prioritize compounds that have the appropriate physicochemical properties based on the nature of your target. Most importantly, this will give you a shopping list of compounds that you can purchase and test before you build significant synthetic chemistry resources in your team. The same approach allows you to move from one chemical series to another – particularly useful when you are looking for a backup compound to fill a hole in your portfolio or overcome a deficit in your existing series. You can purchase millions of compounds from chemical vendors, however, these still only represent a fraction of all possible compounds – even if we only consider molecules that are small enough to be used as drugs. Substances produced by organisms have evolved to form interactions which are not always available to off-the-shelf chemicals. Sometimes it is better to design your own library so that you can build in features that explore different regions of chemical space or mimic the properties of natural products. We can help you design libraries that move you into new areas of chemical space or focus on specific features of a molecule. One approach to getting better coverage of chemical space is to work with low molecular weight compounds (<300 Da), termed fragments. Linking these together can generate larger drug like molecules, however, accomplishing this is recognized as a difficult task. Spark, a scaffold hopping and R-group exploration application, enables us to offer you a tailored solution to this problem, using fragment libraries constructed from those that occur in biologically active molecules. New suggestions for compounds to make can be built to fit the binding cavity in a protein structure. See how Spark was used to grow and link fragments. We have worked on hundreds of projects on different biological targets and would be happy to discuss the best approach for accelerating your assets through the pipeline. Contact us for a free confidential discussion.